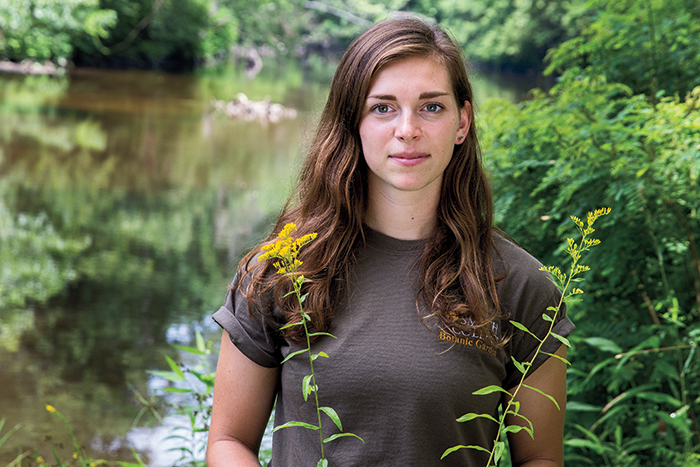 Biological sciences major Abby Onos '17 spent the summer as an intern with the botanic garden, working on the Mill River Greenway Initiative to restore the waterfront. On a morning in July, botanic garden summer intern Abby Onos ’17 loads a utility vehicle with heavy-duty garden tools and heads to the banks of the Mill River. Guided by internship coordinator Gaby Immerman (aka “the den mother for dirt lovers”), Onos measures a 2-by-5-meter space and uses a sledgehammer to drive a PVC pipe into each corner of the plot. A goose and six goslings float down the river as Onos scans the plot for invasive plants. She pulls up some Oriental bittersweet (“It’s really good at outcompeting other plants”), knowing in a few days’ time she would plant native grasses and goldenrod in its place. Here, the biological sciences major from Maine explains how her work contributes to the big picture of botany at Smith. As a summer intern, I do rotations through all departments within the botanic garden. These include arboriculture, collections, the gardens and the greenhouses. When not in these rotations, we’re on crew. On top of this, each of us has an independent project we pursue pertaining to our botanical interests. It’s not all about weeding! On crew, we help out with whatever needs to be done around campus. This can include planting annuals in the various gardens, dividing perennials, pruning woody plants and, yes, doing quite a bit of weeding. My independent project involves waterfront restoration and stewardship: setting up plots along the waterfront, eradicating the invasives in these plots and planting natives in the holes we created during the invasive removal. I have to watch out for bothersome plants like poison ivy, stinging nettle or the nasty recurved thorns of multiflora rose (an invasive plant found in abundance along the river). All of which I have become quite familiar with. The long-term goal is to see which native plants thrive in the areas where we have planted them. We are really only in the infancy of restoring our waterfront to a native habitat. What we learn this summer will help us make further educated decisions about waterfront restoration along the Mill River. To me, stewardship means that we care about our campus, especially Paradise Pond and the Mill River. We are so fortunate to have such a beautiful ecosystem right here in our backyard. My favorite places on campus are Paradise Pond and the Mill River! Not only are they incredibly beautiful locations, they’re also full of wildlife if you know where to look. Spending the summer on campus is great for becoming involved in Northampton and exploring the natural area. I’ve discovered many beautiful swimming holes along the way. I decided to major in biological sciences because I have a natural curiosity about the world around me. I love to observe and look closely. I am constantly amazed by the biodiversity surrounding me, and being able to study my passion is very exciting to me.